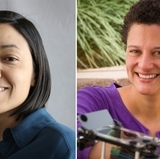 A group from The University of New Mexico has received a grant from the National Science Foundation for a project that will develop a way to produce solar cells using nanotechnology, which could translate into more cost-effective solar panels for residences and businesses. “The grant of nearly $1 million over four years will support the science and engineering group to make solar cells more efficient by trapping the sunlight more effectively than currently possible,” said Sang Eon Han, assistant professor of Chemical and Biological Engineering and the lead researcher of the project. Making solar cells more efficient has been a hot topic of research for several years. Previous approaches have not been largely successful, but the UNM team says their approach relies upon different technology than what has been previously tried. 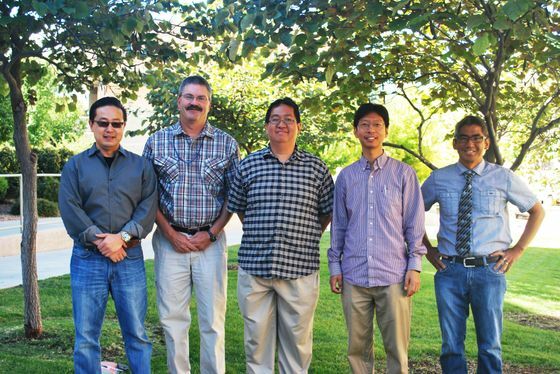 Solar project leaders (from left) are Sang M. Han, Randall Schunk, Kristianto Tjiptowidjojo (of the Schunk group), Sang Eon Han, and Nick Flor. Not pictured: Steven Brueck. Sang Eon Han says their research is unique because it uses nanostructures of “controlled symmetry” in solar cells. The effective light trapping could reduce the weight of solar cells. Reducing weight continues to be a challenge in solar cell production. Making solar cells lighter and easier to transport and install, could expand the use of solar in homes and businesses. Team members on the project are Sang Eon Han; Sang M. Han; Steven Brueck, distinguished professor of Electrical and Computer Engineering Emeritus; Randall Schunk, a national laboratory professor in the UNM Department of Chemical and Biological Engineering; and Nick Flor, an associate professor in the Anderson School of Management. Flor will be working with the engineering team to develop immersive interactive visualization of the scientific concepts in the project for use in middle and high schools to encourage students to become interested in science, technology, engineering, and math disciplines. The project, “Scalable Surface Corrugation of Silicon Surfaces for Enhanced Light Trapping in Solar Cells,” is part of the Scalable Nanomanufacturing Award program though the NSF, which has the goal of translating the science of nanotechnology into products that directly benefit society. The project began Sept. 1, 2016, and will continue through Aug. 31, 2020.